Turbulence Sound Matrix (TSM) is a 3,200 watt RMS, 64-channel sound immersion and diffusion system. 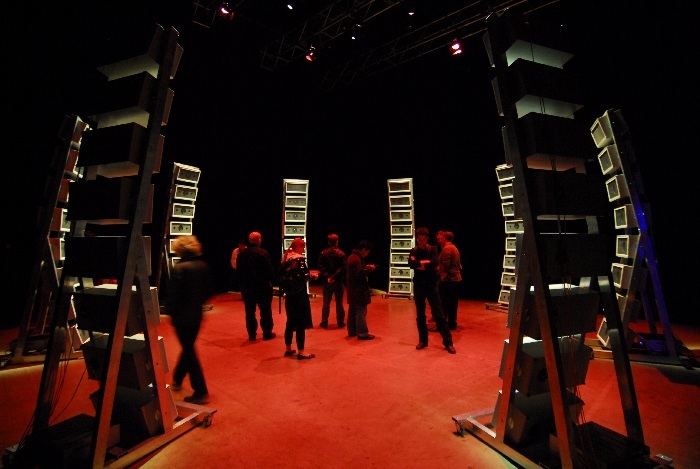 Created for TSM installation presentations, Signe (2008), a 64-channel digital music/audio art immersion composition that uses several layers of wind patterns (WSA) to generate and control the composition for unlimited durations. Signe with TSM creates a vivid, highly articulated, and fully immersive sonic environment for the listener. TSM consists of 8 custom-made, slightly concave, free standing speaker columns that stand 3,33 meters (131 inches) tall, 0,9 meters (36 inches) wide, and 1,12 meters (42 inches) deep. Each speaker column carries vertically, 8 discrete channels of sound through hand built speaker cabinets using 6.5 inch, 4 ohm, high power, full frequency coaxial speakers. TSM diffuses sound horizontally, vertically and diagonally through a kinetic mapping concept called Wind Space Architecture (WSA). TSM utilizes digital recordings of the wave patterns of the wind (WSA) to diffuse sound through nature. The wind data was recorded using a 64-channel wind sensor network, the Wind Array Cascade Machine (2003). 2009 – Honorary Mention in Digital Musics, Prix Ars Electronica 2009 Linz, Austria. 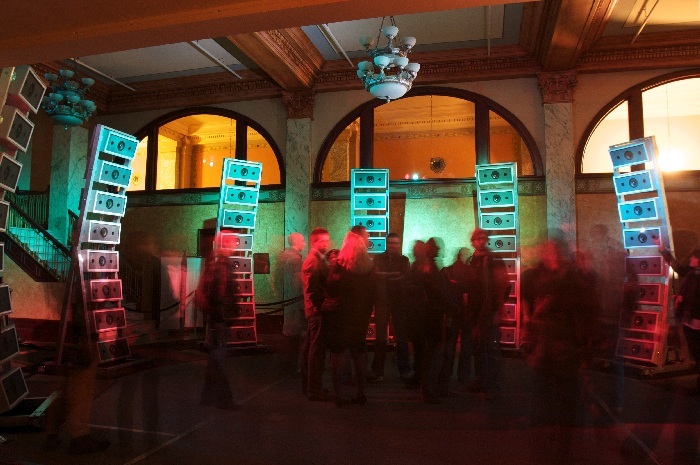 Turbulence Sound Matrix and the composition Signe were conceived, designed, and created by Steve Heimbecker. Max MSP Programming: Etienne Grenier & Simon Laroche. TSM was produced with the assistance of the Media Art Sections by: Le Conseil des arts et des lettres du Québec, The Canada Council for the Arts, La fondation Daniel Langlois, Vidéographe – Le Parc (residency), and Qube Assemblage for Art in Motion.